Hi everyone! Checking in from Salt Lake City this morning. I'm heading over to the home office in Riverton in just a little while and then up to Big Cottonwood Canyon for a little hiking after that. Today I'm sharing with you one of my thank you gifts for a swap I'm hostessing. I made these little treat bags/boxes using the exclusive Stampin' Up! square scallop die! I really love the way they turned out and I'll work on a tutorial when I get home but they are really easy to do. 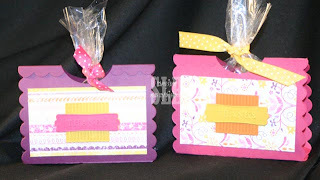 I also used the new Thanks embosslit for these as well and the beautiful Raspberry Lemonade paper. Both of these feature the new In Colors. The one on the left is made with Razzleberry and the one on the right is made with Melon Mambo. It took me a little while to get use to these colors but the more I use them the more I've grown to realize that they are really fun colors! I'll be back hopefully later with some pictures from my day. Tonight I'm meeting with 30 friends for dinner and swapping!! !